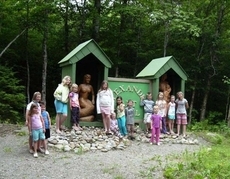 The Alexander Art Trail features the largest hand-carved outdoor sculpture collection in Maine. A perfect place for family outlings, class trips, or oany adventurer who appreciates art in various forms. 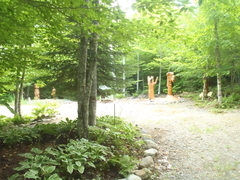 The Alexandria Art Trail has the largest hand-carved, outdoor sculpture collection in Maine awaits the harried traveler along a serene path through the woods. Art Trail can help area schools with art education in several ways. Our painted rock exhibit includes student work as well as examples by teachers and local artists. 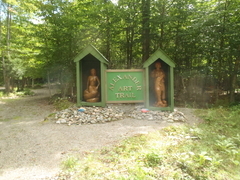 The Alexander Art Trail accepts donations while visting and through PayPal if you would like to make a donation online. Thank you again for your support. 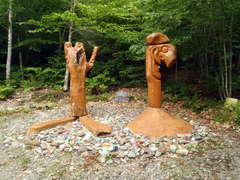 Alexander Art Trail (AAT) is a collaborative effort between a non-profit organization, a local landowner and various artists and volunteers. © 2004-2019 Alexander Art Trail All rights reserved.